Not content with buying your free phones at T-Mobile retail stores, Customer Loyalty or Radio Shack? 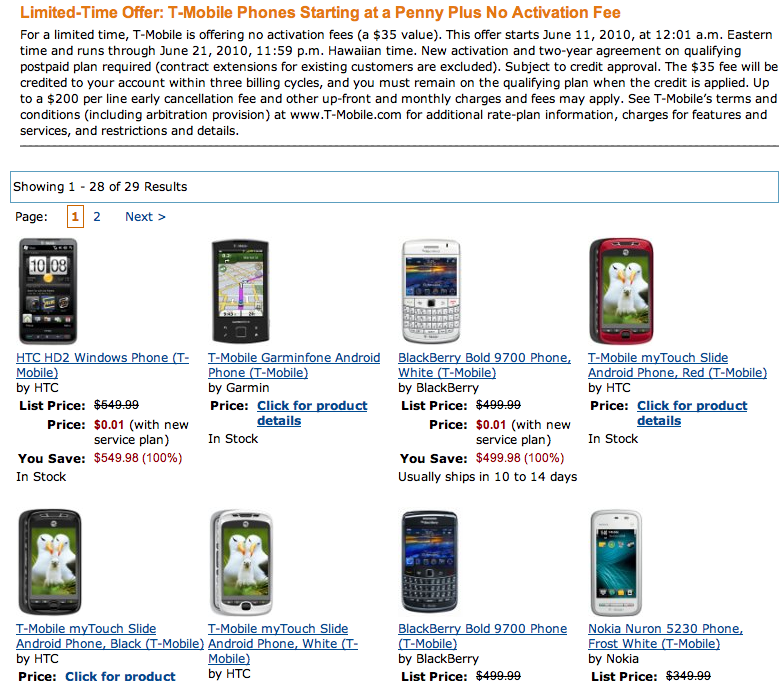 Have we got good news for you, as Amazon is taking its turn at a special T-Mobile offer with all phones for $0.01. Coupled with the low low price on one penny is no activation fee, which of course gets credited to your account within 3 billing cycles. The usual standard Amazon stuff applies here so be careful of what you sign as Amazon has their own policies regarding cancellations, rate plan switches etc. Not a bad deal for one penny though, not a bad deal at all. It’s not free, but really, one penny is as good as free, especially when you have no rebates. Of course the standard 2 year commitment applies! ← Are You Taking Advantage Of Today’s Father’s Day Sale? Thats pretty cool. Everybody is in the cell phone biz now I guess. Yeah, I would rather do through shack or retention. No equipment fees in case you cancel later. I might do this, but I don’t understand TMobile’s pricing. If I get a “free” phone on contract, I pay an additional $20/month for my plan, right? For 24 months, that’s $480. Isn’t that paying for a phone over 2 years? Where’s the free in this? Am I missing something? I’m not sure what’s so difficult to understand. It’s a free phone. Doesn’t mean the service is free. If you win a free car, do you expect gas for free too? I just upgraded one line on my current family plan contract (full 22 month eligibility) on Amazon to a MyTouch Slide for $.01. I did not need to switch my plan and no mail in rebates. how? i only see options to change your plan.. not keep it. Anyone? I seriously wan’t asking a rhetorical. Yeah, and since your internet service costs $40/month for your home, you’re not really paying $500 for your laptop, you’re paying an additional 960 dollars over 2 years. That’s not 500 dollars, that’s $1460! How dare Walmart and Comcast team up to charge you that much for a damn 500 dollar laptop!!!! I believe you are talking about smart phones, and all carriers require the 20-30 a month internet plan for smart phones not just TMO. It sux and is why I don’t have a smart phone any more. I don’t mind paying for internet. What I’m talking about is the $100 vs $80 unlimited plan. It seems the only difference is that I’m paying $20/month and getting a “free” phone. One other thing. I’m wondering if I can go somewhere that price matches, like WalMart, get the phone for a penny, and put it on a Month to Month plan with Tmobile. Hmmm…could get interesting in WalMart tomorrow. Uhhh…. You may want to reread the details. Walmart idea won’t work-they require 2 years. am I missing something on the 2 year premium I will pay? Am i looking at it wrong? am I not just paying for a phone over the course of 2 years? so are all of them (T-Mobile, The Shack, Amazon, etc.) still only Family Plan required? or can i do my Individual upgrade? Give it a shot and see if it works for you, just be sure to read the fine print. thx.. i went there (no MIR, so only a penny).. it ends on the 21st.. but i selected individual upgrade, but couldnt figure out how to keep my plan. Why do people make everything so difficult? Everybody needs to work on the other side to understand how it all works. 1) These phones are not cheap. Blackberry had 30% profit increase last year. Was that from giving away the farm to T-Mobile? 2) Any carrier, not just T-Mobile is not profitable till around the first year after you get a smartphone. Its costs TM when you call, it costs TM when you have a voluntary or involuntary suspend, it would cost TM if you didn’t have a data plan. 3) People are looking at their cell phones like we use to look at those old small calculators. That isn’t just a piece of eqipement, that is your lifeblood in your hands. You know what would be simple? If Tmo explained their pricing for what it is. Having just looked into Tmobile recently, I honestly thought that there had to be more to it, as this is blatantly calling a phone “free” and then requiring you to make payments on it. I’d rather have them tell me that they have ONE set of plans, and if you want to get a phone with “no up front cost,” you need to commit to 2 years of paying off the phone. $20 premium X 24 months = $480 (or, about the cost of all these smartphones) But $480 is not FREE. I have no problem buying a phone outright, and paying for service. In fact, that looks like what I’m about to do. And now that I’ve looked further, I may even take a chance on Simple Mobile’s new UNLIMITED data plan for $60/mo. Unlimited, of course, means that if you use too much data, they’ll turn down your speeds for the rest of the month. Gotta love the marketing! Bah, you click on contract extension and it makes you select an Even More plan. I’ll not be leaving my myFaves plan for amazon. Hell with it. Strange.. it let me keep my grandfathered pre-myfaves family plan. YMMV, I guess. dont do it, the catch is amazon will charge you 250 if you cancel before 181 days thats 6 months. then tomolbie charge is 200. thats 450 to cancel. I’m glad that I waited on a phone. The selection available would not satisfy me. The HD2 is soon to be discontinued. There is to be a Android device with the latest version preinstalled next month. If you did the free phone thing now you would not be eleigable for an upgrade next month. I hope the rep that I spoke with at the shack was right and I think he was telling me the truth. I’m not sure where people are getting a $20 month increase. I just ordered a MTS for $0.01, kept my same family rate plan, and monthly unlimited text & data was $40 per month. I was already paying $34.99 with my mytouch 3g so that is only $5.01 more per month. After I get the phone I plan to call T-mobile and ask to keep the same data/text plan. Even if they say no, $5 more per month is worth it for a free phone. Very happy with Magenta! You’ve got a family plan. Indivdual plan is $20/mo more for Even More (opposed to the no contract even more plus). This makes the phone actually more expensive with this deal. Let me let you know, Amazon is telling people that if you have the family unlimited non-contract, that this offer will not force you into the higher cost contract. This is not a good deal, any way you shake it. Scam, avoid at all costs. Someone check my math but this seems like a bad deal. In order to get it for free, you have to sign up for a Even More plan, which is $80/mo (with 500 min/web/text), $20 more than Even More Plus ($60/mo), so subtract that difference and the phone ends up costing a total of $480 over the required 24 months. However, buying the phone at retail price from T-Mobile is only $450, and T-Mobile offers the no-interest option to pay it off at $22.50/mo for 20 months, still $450. I learned to sell in the 4th grade, whilst doing a fund raiser for my hockey team. I couldn’t sell a $.50 candy bar to save my life. Until I jokingly told a fellow 10 year old, “I’ll give you TWO for FREE if you just donate a dollar.” I eventually was banned by my teacher from selling, as I was moving 48 candy bars a day…to 31 students. I thought as adults people wouldn’t fall for the same tricks 4th graders are prey to. Nope. I, like you, did that same math and came to the same conclusion. I also had confusion on the simplicity of it all. It’s so blatantly obvious that this is a load of crap that I had to keep sniffing. just ordered a t-mobile mytouch slide for $0.01. and that was the upgrade price!!!! im already on a family plan and i just extended my contract for 2 more years and i basically got it for free!!! amazon is awesome!!!!!! Does anyone else have their order from Amazon still saying”not yet shipped”? I ordered mine on saturday and I figured it would ship today. The estimated delivery says by june 23rd.